There is wide range of porch sizes and there is no standardization exists when it comes to porch width or length. Technically front porch can be built any desire dimensions. But practically there are might be some restrictions which could limit seem like endless possibilities to creativity. While planning which porch size is the best always take into account its practical use. If the front door is 36” wide, it is possible to build 6 feet wide porch for placing a single chair which won’t be right in the middle of walkway into the house. For putting smaller table and two chairs, length of the porch has to be at least 85” – 96”. For fitting couple 28” x 80” patio lounges longer porch dimension has to be minimum 10 feet and so on. 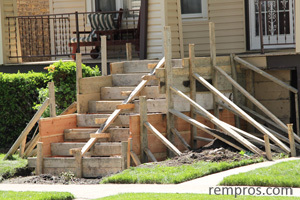 In many cases actual dimensions of a front porch is not a factor of cost determination. Building 5’ x 12’ pressure treated lumber porch on 4 tube piers could be significantly cheaper compare to constructing stylish covered porch with concrete slab foundation, custom welded steel railing and slate roof on brick pillars. Existing house design always impact which style, type and porch size will be the most appropriate in particular case. Wood porches are very common and relatively easy to build. Adding simple 4 x 6 feet lumber porch to the house finished with vinyl siding might be a great solution. Many brick homes initially built with covered porches as a part of a whole structure and there is no need in redesign or improvements except periodical maintenance of weather vulnerable elements. Most of city lots have standard dimensions and often space around houses very limited. Even though 7’ – 9’ distance from the house to the street seems like more than enough to build spacious porch you still probably want to leave some space for nice landscaping. In addition, before making plans always check local building codes and city regulations especially if customization is a preferable option. Type of the front porch is a main factor which might affect the decision whether to spend a few days and complete building the porch as do it yourself project or hire a contractor. Constructing uncovered 4’ x 8’ lumber porch on pressure treated 6”x6” with no stairs is not a complicated task for majority of handy homeowners. At the same time, masonry work or welding requires some skills. Inexperienced do-it-yourselfers should think twice before considering decreasing cost of labor and start building such concrete or brick porch with metal railing by self.